It’s really crazy that it’s that time of year and also that I said yes to the insanity again! I know, I know… but it was a wonderful sort of panicky busy. Almost all the work is over for the opening and if you missed any of it, you can watch it unfold on my Facebook and Instagram pages. No flowers, this year. I went to the shore for inspiration. I’m sort of drawn toward blue right now. Okay, that makes me sound sane. It’s more like I’m obsessed with blue and I can’t get enough of the color. That – deep indigo not as deep as navy, a little greenish, but not teal – shade of blue. I also like colors that are hard to describe, apparently. So, in April I started painting my way through 50 shells, messages in bottles and beach arrangements with the backgrounds of color you’d find from the shore to the midnight zone. I must say that I’m not tired of these colors. Not one little bit. Summer Mosaic opens THIS WEEK, so I thought you may like to see all the paintings and information about the show. It will work just like last year with one addition. This year the show is open for only viewing for three days before the show begins to be dismantled by sales. Monday thru Wednesday anyone can come in and enjoy over 30 artist’s labor to create 50 succinct artworks. It is quite an experience. Each artist’s set of works is unique yet they beautifully work as one unit. 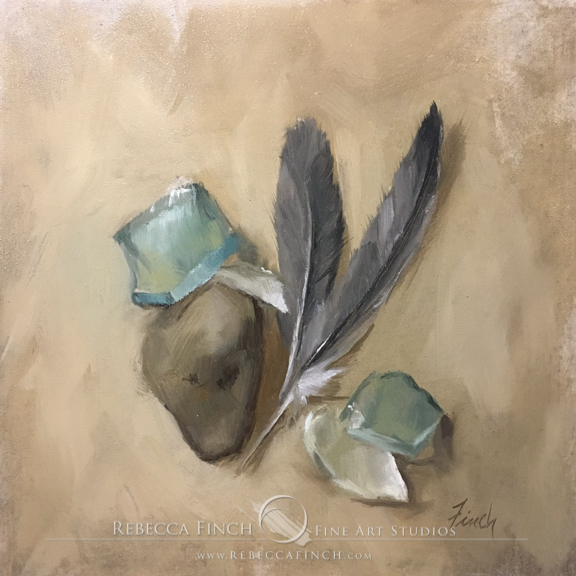 My unit of paintings is entitled “Coastal” and features shells and other items in various color palettes that work for any home color scheme. You can see everything you need to know about Summer Mosaic here. View the paintings, get info on dates, sales, tickets, and links to view the journey to 50 paintings all at this little handy-dandy link!